There has been much written on the impact of international treaties like the Trade Related Aspects on Intellectual Property (TRIPS), which laments the failure of patent systems to respond to the interests of a diverse set of non-profit, public interest, and non-corporate entities. This book examines how patent law can accommodate what James Boyle terms a "politics", that is, "a conceptual map of issues, a rough working model of costs and benefits, and a functioning coalition-politics of groups unified by common interests perceived in apparently diverse situations". A Politics of Patent Law provides a substantive account of the ways in which various types of participatory mechanisms currently operate in patent law, and examines how these participatory mechanisms can be further developed, particularly within a regional and international context. In exploring this, Murray highlights the emergence of constitutional law in international intellectual property law as being at the centre of the patent bargain and goes so far as to argue that the constitutional tradition in intellectual property law is as important as TRIPS. 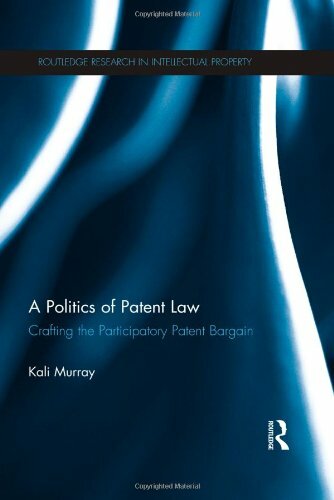 Ultimately, the book sets forth a "tool-box" of participatory mechanisms which would allow for, and foster third party participation in the patent process. This book will be of particular interest to academics, students and practitioners in the field of IP Law. Professor Kali Murray is an Assistant Professor of Law at Marquette University Law School. Professor Murray's research agenda is focused on the "politics of participation" in patent and property law. Recent work includes Dynamic Patent Governance in Europe and the United States: The Myriad Example (co-author, Esther van Zimmeren).